Repairs are the most important step in a total wildlife control plan. They ensure that no more new animals can ever get back in to the building, and if done right, keep animals out for good! AAAnimal Control offers a full 12-month guarantee on all of its repairs against any new animal entry. 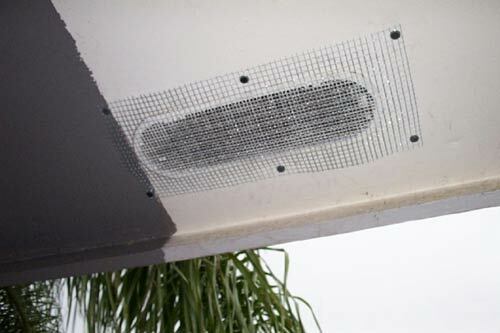 Below are just a few of thousands of examples of the types of animal-proofing repairs that we do every day. Prices for repairs may range from zero or very little cost if they are minimal, to several hundred dollars for larger, more complex repair work over a wide variety of areas. An official price estimate will be provided for you after a complete building inspection. Here we see a classic raccoon entry point under a soffit where it meets the roof. I seal it off with steel and sealant, and then cover it with metal flashing. Here is an open hole leading into the home under a bathtub. I screened it after removing a dead opossum. 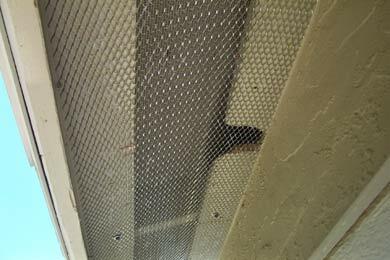 This persistent squirrel chewed into this flimsy soffit screen, until I screened it with heavy steel. A raccoon broke this soffit, but after catching it, I repaired the soffit as good as new. Rats were entering the home through this power supply hole behind the stove until I sealed it with metal flashing. 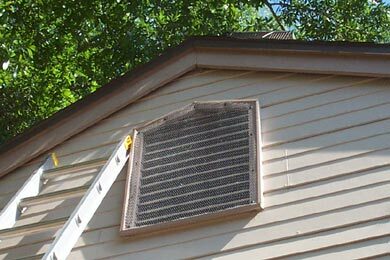 Here we see a classic gable vent, which squirrels were using to go in and out of the attic of this building. Another attic vent. Rats were getting in through this one until I sealed it off with heavy steel screen. Rats and squirrels were entering the attic through this large gable vent. Look at the flimsy and deteriorated old screen that I replaced with new steel. Rats were entering the attic by going under these tiles and in through vent holes, before I screened them all with steel. 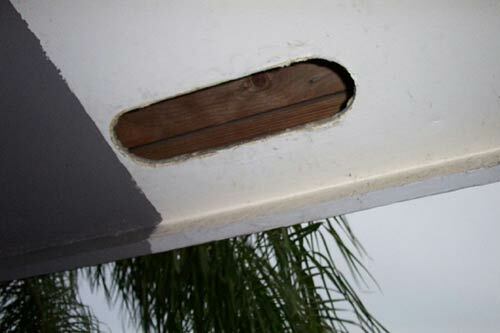 A raccoon was going in and out of this oval soffit vent hole before I sealed it off. AAAnimal Control is a professional nuisance wildlife control company. It is my goal to provide information so that you can solve your wildlife problem in an effective and responsible manner. Wildlife services include animal trapping, capture & removal, plus animal damage repairs and preventative measures. You can always browse this site for more details and info about wildlife removal. If you live elsewhere in the US and have found this site and need a local trapper in your area, click here for a nationwide list of 100's of professional wildlife experts.